With a stay at Affordable Suites Myrtle Beach in Myrtle Beach, you'll be within a 10-minute drive of Myrtle Beach Speedway and Tanger Outlet Center. This hotel is 7.2 mi (11.5 km) from Family Kingdom Amusement Park and 7.4 mi (11.8 km) from Ripley's Aquarium. Make yourself at home in one of the 33 air-conditioned rooms featuring kitchenettes with full-sized refrigerators/freezers and stovetops. Complimentary wired and wireless Internet access keeps you connected, and cable programming provides entertainment. Conveniences include microwaves and coffee/tea makers, and housekeeping is provided weekly. 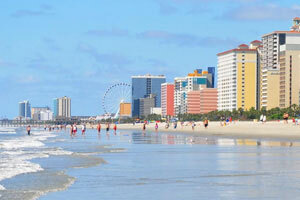 The preferred airport for Affordable Suites Myrtle Beach is Myrtle Beach, SC (MYR).